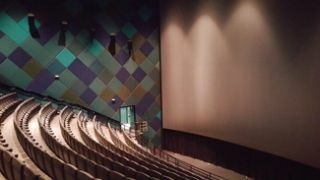 The recently renovated Audubon Nature Institute in New Orleans, LA now boasts one of the largest immersive digital 3D cinema experiences in the U.S., due to a 46-foot high by 76-foot wide, 2.2 gain Severtson SēVision 3D GX silver screen. “The digital transition allows us to continue to offer quality institutional movies, and maybe participate in alternative content such as live concert or theatrical events, speaking presentations, gaming events, and movie festivals," said Audubon director of theater operations Rodney Daniels. The Audubon Nature Institute’s $1.2 million Entergy Giant Screen Theater opened October 15 with Disney's full-length feature “The Little Mermaid” in 3D. A grand opening slated for November 18 will include the premiere of “Journey to Space,” a documentary on the ongoing mission to Mars, narrated by Patrick Stewart and presented by the theater’s sponsor, Giant Screen Films.Entertainment Supply & Technologies cinema engineers of Tampa, FL renovated the existing theater at Audubon, coordinating and installing an entirely new, fully digital experience. In addition to the Severtson screen, the new Christie Duo 4K digital projection with 46-channel Dolby ATMOS sound allows Audubon to have its pick of first-run Hollywood features. The new immersive sound is supported by QSC audio components mounted on StarGrid, a proprietary speaker grid system by Adaptive Technologies Group.